Glide these tempered steel, multipurpose scissors through virtually anything. Their soft, fitted grip and curved blades are made to last and accommodate lefties and righties alike. With built-in features to crack nuts, crush garlic, open bottles, and strip wire, these heavy-duty blades are definitely the sharpest tool in the shed, kitchen, office, garage . . .
Dimensions: 4" x 8.5" x 0.75"
These scissors do it all! Wether you cutting up chicken wings or daisies they handle what ever you throw at them with ease. I like the balance and feel in my hand and the fact that they do everything but cook my dinner! 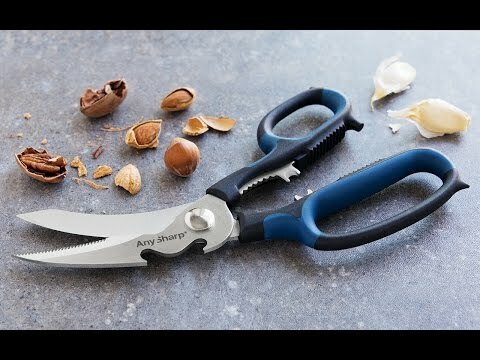 I was able to split up 5 lbs of chicken wings in less than 10 minutes with these, which normally took me close to an hour with my old scissors. Super sharp and functional. One for the tool box and one for the kitchen. 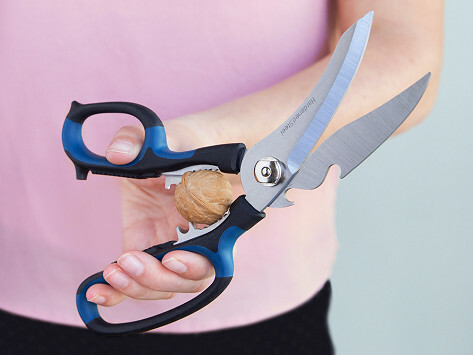 These scissors won’t judge your handedness either. AnySharp’s soft, fitted handles make them comfortable for lefties and righties alike.